Commercial buildings represent just under one-fifth of U.S. energy consumption, with office space, retail space, and educational facilities representing about half of commercial sector energy consumption. Because of this, it is important for architects to look for ways to reduce energy consumption in commercial buildings. Exterior shading systems are an effective way to reduce solar heat gain, and therefore reduce HVAC loads. In addition, effective use of daylighting can reduce the amount of artificial light required in a building. Daylighting is the harvesting of natural light to reduce the need for artificial light to light an interior space. Daylighting can also bring in that solar heat gain when desired. Exterior Shades play a crucial role in helping a facility control its temperature and light levels. Exterior treatments offer a modern design and the functionality that todays building are in demand for. 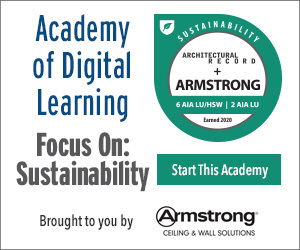 This course provides an overview of exterior systems and how each operates and can play a role in energy efficiency and aesthetics. Enumerate the factors that influence the choice of a shading system that will add to a building's sustainability profile and user comfort. Draper, Inc. is a Spiceland, Indiana-based manufacturer of gymnasium equipment, window coverings, and audio visual equipment. As one of the largest manufacturers of gym equipment in North America, Draper builds custom solutions for gyms of all sizes and types.